Date: TBA (it won't be run in 2004). Description: Along Orphan School Creek Cycleway, Clear Paddock Creek, Bus Transitway, west beside Elizabeth Drive, north alongside Cowpasture Rd, then to Calmsley Hill City Farm, then north via Sydney Water Channel and Western Sydney Regional Park to Prospect Reservoir, then east via Lower Prospect Canal Reserve to Guildford, then south on Parramatta to Liverpool Rail Trail, to Orphan School Creek Cycleway to return to start point. All riders under 16 years must be accompanied by an adult. Ride is 100% off road cycleway. About 40 km long. There will be a short 5 km kids ride along cycleway during whilst main ride is on, but all children MUST BE ACCOMPANIED by a responsible adult. This is not child minding for the main ride, but entertainment for family groups. Bikes with training wheels will be most acceptable. We encourage all relevant councils to financially support this ride, and we thank those that have already done so. We hope councils can see the benefits of using our ride to promote cycling and get more involved. 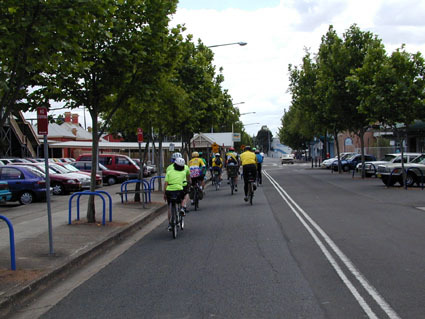 Promotion is a key part in councils' role under BikePlan 2010 and was a main improvement residents wanted. 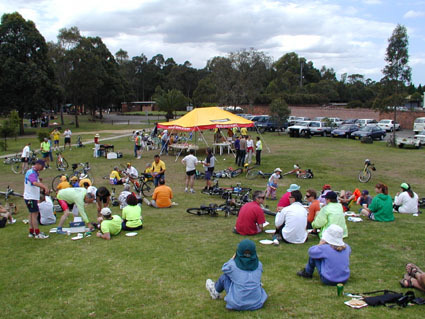 This is an annual community ride, organized by Cyclists' Action movement West (CAMWEST), with the assistance of Bankstown Union of Bicyclists, Bicycle user Group of Fairfield and Holroyd, and the Lidcombe-Auburn Cycling Group. It is sponsored by Auburn, Bankstown and Holroyd councils. CAMWEST gratefully acknowledges the support of Bankstown City Council in making the 2000 annual ride possible. The ride always follows a circuit between Homebush and Fairfield. It is held yearly, usually in Spring. A great free lunch was kindly provided by Bankstown Council. 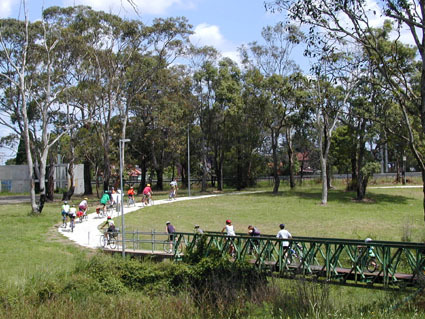 The Bay to Mountains Cycleway, running in a circuit between Homebush bay and Fairfield City Farm, was proposed in a joint venture by CAMWEST and Arup Transportation Planning. After completing a consultation for Green Games Watch 2000 and lobbying the Minister for Roads and Transport, Carl Scully, the route was funded at $6.5 million. This is a major boost for cycling in the west, so come along and watch it grow! The Bay to Mountains ride went well. We'd like to thank Auburn and Parramatta Councils for their financial help to cater for the free lunch. Make sure you come next year. The last CAMWEST Bay to Mountains ride was held on Sunday October 29th, 2000. It was a huge success, with about 80 riders and 100 people signing up for our free lunch. 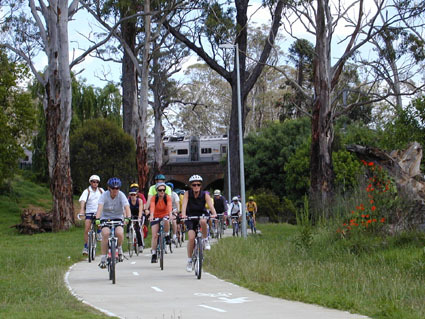 The route included a good section of the brand new Parramatta-Liverpool RailTrail cycleway, for which we heard many good comments. The ride was a success. Numbers were much larger than expected, and the general feedback was very good. Most riders were not keen cyclists but normal, average residents who wanted to go for a ride. Nearly all of these residents want better cycling facilities. It would be better to keep the ride free, and it would be unreasonable to charge more than $5. Word of mouth was the best way to promote the ride, followed by the CAMWEST website and e-newsletter. ... and they thought councils could be doing a lot better. Yummy lunch - thank you Bankstown Council!